NYC, 04/30/2019, 6:30PM. All That You Leave Behind: Coping With The Loss Of A Beloved. In 2015 David Carr suddenly collapsed in the newsroom of The New York Times and died shortly thereafter. 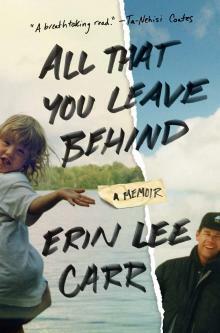 Wracked by grief, his daughter, documentary filmmaker Erin Lee Carr, went looking for support and comfort in the lifetime of correspondence that they had shared. She was also looking for clues or advice the famous mentor, intrepid journalist, and fiercely loving father might have to offer on how to cope with her devastating loss, and continue on with her life and career. What began as an exercise resulted in her memoir, All That You Leave Behind, a coming of age account that charts family, addiction, and resilience. Carr shares with readers the unparalleled advice and mentorship that her father was known for generously extending to the many young journalists, as well as to his daughters who came up under his care. Erin Lee Carr will be joined by one of her father’s admiring mentees, Ta-Nehisi Coates, to discuss the legacy David Carr has left for his family, the journalistic community, and readers at large. Erin Lee Carr is an American documentary film director, writer, and producer best known for her HBO documentaries Thought Crimes: The Case of the Cannibal Cop and Mommy Dead and Dearest. Carr was listed in Variety's Documakers To Watch in 2015 and was recently named in Forbes 30 under 30 list of most influential people in media. She is the daughter of the late New York Times media columnist David Michael Carr.